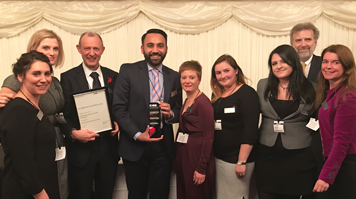 The Highly Commended status for Enterprising Learning Provider of the Year was presented to London South Bank University (LSBU) at the Institute of Enterprise and Entrepreneurs (IOEE) Celebrate Enterprise awards ceremony at the House of Lords. The IOEE awards, organised in partnership with the Sector Skills Body for Enterprise and Enterprise Support (SFEDI Group), recognise the very best in enterprise learning and skill development across the UK. The commendation celebrates LSBU’s commitment to supporting students and graduates to become the next generation of entrepreneurs, develop their enterprise skills and start up their own businesses. “Congratulations to everyone at LSBU! This great achievement recognises the collaborative work that the Entrepreneurship and Innovation Institute team has done in partnership with LSBU’s seven Schools, and particularly the School of Business. Part of the REI team based at the Clarence Centre for Enterprise and Innovation, the Entrepreneurship and Innovation Institute delivers skills support, competitions and start-up programmes to help students and graduates to develop their skills and drive forward new, innovative ideas. This commendation follows another recent global award win for LSBU at the Global Consortium of Entrepreneurship Centres (GCEC) for Outstanding Emerging Entrepreneurship Centre. LSBU has also been shortlisted in the Entrepreneurial University of the Year category at the Times Higher Education Awards and the Duke of York Award for University Entrepreneurship at the Lloyds Bank National Business Awards. The winners are to be announced later this month.